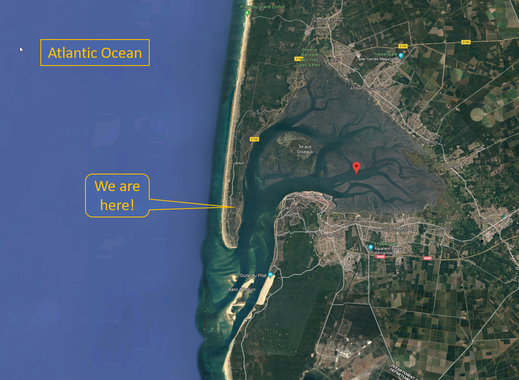 Der Cap Ferret und die Bucht von Arcachon - bonnafys Webseite! 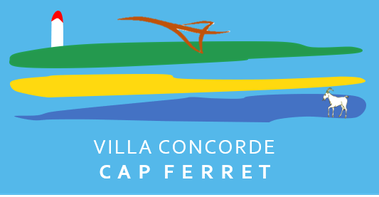 The Cap Ferret is less than one hour away from Bordeaux Mérignac airport. 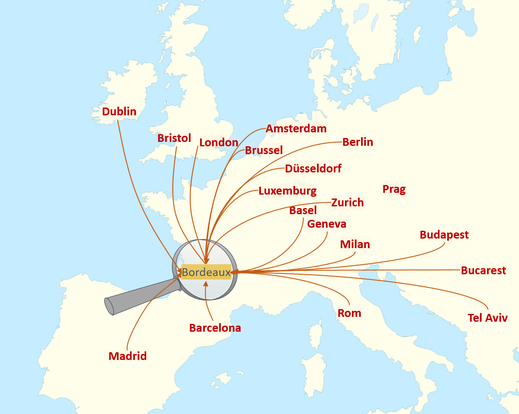 Bordeaux is connected with all these towns in Europe (actually a lot more, but it would make the map unreadable). Once there, you can either rent a car, or take a taxi, or minicab drive to the Cap Ferret. We will gladly help you find the best way to get here. If you are in Paris, the best way to come is by train to Arcachon and then the boat shuttle to us. This is really the best way to start your vacation or your weekend. Crossing the bay (in half an hour) while the sun sets on the Cap is simply magic. From there, it is a 10 minute walk to the villa. On the Atlantic coast, the courageous little river Leyre created this unique bay. In the middle is Bird's Island , l'île aux oiseaux. At the bottom is the Dune of Pyla, the highest dune of Europe and a place with an astonishing vista. Closing the bay on the left is Cap Ferret. We are on the "pointe" of it, almost exactly at equal distance from the Ocean beaches and the Bay beaches. All around the bay are bicycle ways. The bay itself is great for swimming, sailing and kayaking, if the water is calm enough, stand-up paddling is a real pleasure. The ocean side is much wilder. If you walk just a bit, you can have 100 meter of beach for you alone. Swimming in the waves of the Atlantic Ocean is not without risk and you have to learn a few things about tide and current first. The best way is to book a few surf or body-board (Morey) lessons. We have a few really good spots here and we can recommend to you good, reliable teachers. For the ones who like it softer (and warmer) the Bassin is perfect: no big waves and family friendly beaches. There is a lot of potential excursions either to Arcachon (Aquarium), Bordeaux, the wine region.